The migration of settlers to Green was fueled by the pursuit of a growing new religion. Green was part of the first Evangelical Circuit west of Pennsylvania and was a played a crucial role in the development of the Evangelical Association in the Midwest. Early settlers, Conrad & Catherine Dillman, offered their home as a meeting place for a newly formed congregation to meet. Circuit preachers would lead the congregation, first in the Dillmans’ log cabin and later in their newly constructed brick home. 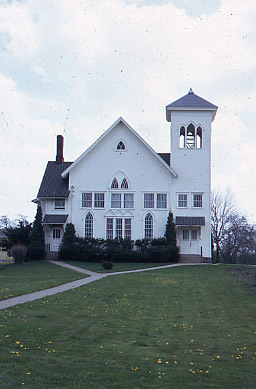 The first Evangelical Church in Ohio, Emanuel Evangelical, was constructed just outside of Greensburg in 1838. 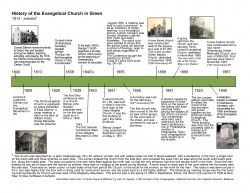 As the congregation grew, larger churches were constructed in 1851 and 1889. 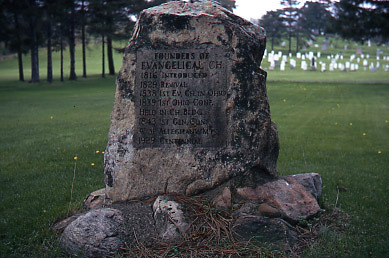 The Greensburg congregation hosted several conferences of Evangelical leadership, including the 1843 General Conference. This was the first General Conference held west of the Allegheny Mountains. In 1855 a seminary, or church supported college, was established in Greensburg with an enrollment of 19 students. By 1856 the enrollment was 56 men and 40 women. That same year a dormitory building was constructed to house the students. Unfortunately by 1859, financial support for the seminary from eastern congregations diminished, and by 1865 the school was closed. The Dillman Home, the Seminary Dormitory, and the 1889 Church still stand today.